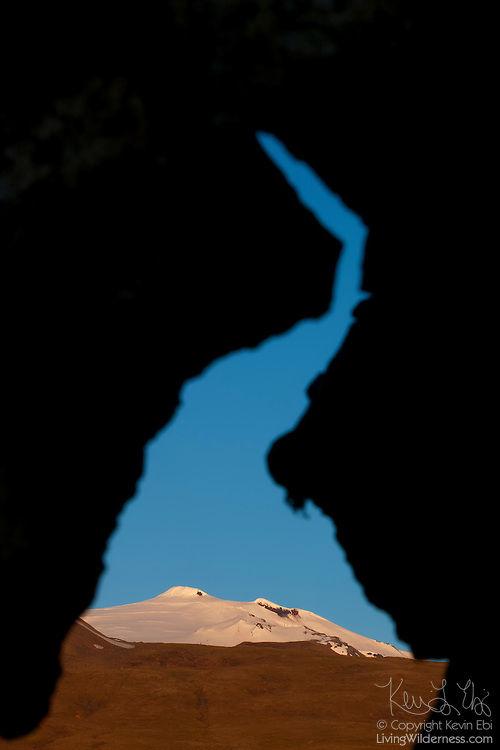 Snæfellsjökull, a 1,446 meter (4,744 foot) stratovolcano, is framed by a natural arch in a lava field in western Iceland. The volcano, which is active, last erupted approximately 1,800 years ago, creating lava fields at its base. The mountain is technically named Snæfell; Snæfellsjökull is the name of the glacier at its peak. It is commonly called Snæfellsjökull, however, to avoid confusing it with several other mountains with the same name. Snæfellsjökull means "snow glacier mountain," and it was featured in the 1864 novel "A Journey to the Center of the Earth" by Jules Verne..